Designation: Cardiovascular Surgeon at the Samara Railway Clinical Hospital, Non-governmental Healthcare Institution, Russian Railways. Citation: Drozdova EV (2018) The Key Approaches to Form a Permanent Native Vascular Access Russia, Samara City. Sch J Appl Sci Res. Vol: 1, Issu: 7 (57-60). Copyright: © 2018 Drozdova EV. This is an open-access article distributed under the terms of the Creative Commons Attribution License, which permits unrestricted use, distribution, and reproduction in any medium, provided the original author and source are credited. The formation of permanent vascular access for the patients under the substitute renal therapy occurs as a rule repeatedly and during a long period of time. This task is rather difficult due to the limited number of vessels which can be fit for the moulding native arterio – venous fistulas. It is impossible to underestimate the topicality of this problem. According to the statistics about 0.5 % of the world population has a chronic kidney disease in the stages of three to five thus they all need to receive the substitute renal therapy in successive steps or lifelong. Moreover, according to the World Health Organization data, it is the fifth most frequent cause among the chronic non-communicable diseases with high mortality rate. - to justify an applicability of the vessels of small diameters in daily practice to produce arterio – venous anastomoses. The methodology of these operations is various and involves all types of anastomoses («end to end», «side in side» and «end to side» for each of the vessels). Thereby the most important decision is provided by the discretion of the surgeon and it will subsequently determine the possibility to form fistulas on the extremity. The first it is the size of vessels to form native fistulas, it cannot be smaller than three millimeters. The second it is the stages of overlay the fistulas (it must be put gradually and alternately, from the level of wrist joints to the shoulders with the increase of the vessels diameters, beginning from a non - dominant extremity and through the each third of anatomic region on the upper limb. These recommendations, will, undoubtedly provide successful subsequent operations. However, this approach eliminates even the probability of fistula formation for a large number of patients who are in need of hemodialysis. In this group patients with diabetes mellitus type one, and insulin – type diabetes mellitus of second type, and polycystic kidney disease and almost all of patients with systemic rheumatological diseases which protractedly take hormonotherapy. Case I: creating fistulas with diameter less than one millimeter for the patient with systemic rheumatological disease. Figure 1: Case I: creating fistulas with diameter less than one millimeter for the patient with systemic rheumatological disease. For the successful creating fistulas the key importance is not that much diameter of vessels as a flexibility of venous wall and the geometry created anastomosis. For sure, the fistulas can mature and function for a long time when are formed with veins with diameter less than one millimeter. Thus, patients who used to abuse drugs or for a long time have lived in the state of uremia without passing sessions of hemodialysis are having extremely rigid venous wall and if it is able to withstand dilatation it will not ripen anyway. Speaking about the phasing of fistulas overlay, there are some specific factors here as well. There are some of the nuance in this. At first, if we speak about the reconstruction of a fistula in connection with aneurysmal transformation of vein, in such a situation it is possible to form anastomosis as with slightly extended tributary veins as form a descending, more distal anastomosis, if there is such anatomical possibly. In the anastomoses with such “accustomed” to the turbulent arterialized bloodstream veins, the maturation process stems significantly quickly even if it applies to the downward trend and it does not affect the operate time. Secondly, if we talk about a thrombosis, there are several reasons why it happens. If it is only the result of hypovolemia or hypotension and the anastomosis itself has the safe diameter and is able to function further on, there are two ways: either thrombectomy or reconstruction with the displacement more proximal one or two centimeters (for the clamping vessels when the anastomosis forms) (Figure 2). 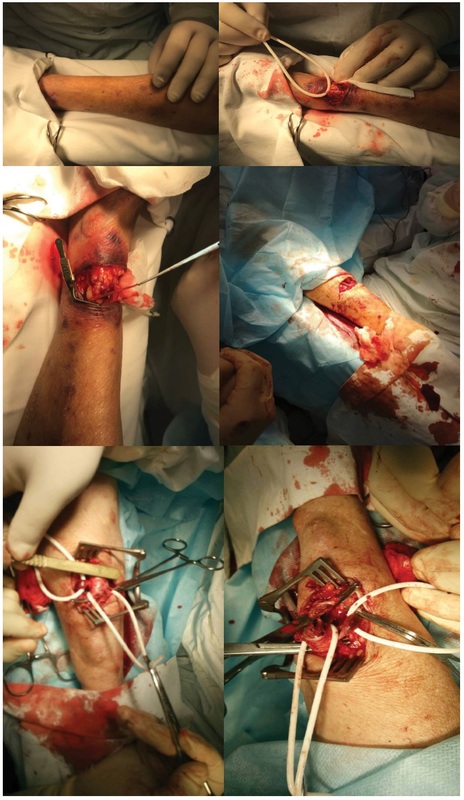 Case II: Creating Anastomosis with Brush of An Aneurismal Transformation Vein of Without Relocation. Figure 2: Case II: Creating Anastomosis with Brush of An Aneurismal Transformation Vein of Without Relocation. If the reason of the thrombosis is low blood flow rate in the artery we should either do the same anastomosis on the dominant hand or perform the reconstruction some more proximal with forming long extensive anastomosis. The issue of relocation of the anastomosis which is closed because of the reduction in size depends only of anatomical feature of the region: if there is a vein brush with diameter as minimum is one millimeter we can form the anastomoses with this vein brush without relocation anastomosis. 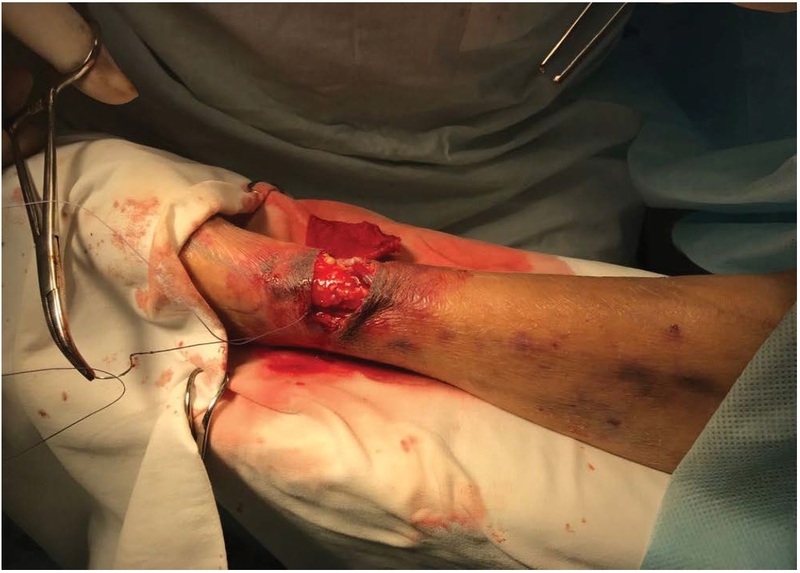 - the cut off the arterial end on the forearm eliminates the opportunity to form fistulas with another artery and frequently with the artery where the anastomosis was formed before. The geometry in the sense of physiology of the created anastomosis and the position of the vessels in the perianastomotic space cannot be pinched or squeezed by the surrounding tissues, including the hypodermic fatty tissue. The reconstruction of native arteriovenous fistulas is not always accompanied by proximal translocation. In some cases, the anastomoses can be overlaid more distal. The wide application of the anasomoses by “the end by end” and “end to side” types with cutting off the arterial end are not reasonable as in connection with small turbulent blood flow in these anastomoses and in connection with the lack of possibility to use the safe artery for the next forming of native permanent vascular access.